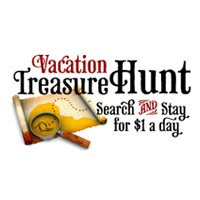 The ResortQuest Vacation Treasure Hunt is a fun online contest where vacation seekers could win a five-night stay for just $1 a day. Intrepid value-seekers who successfully solve clues in ResortQuest's Vacation Treasure Hunt will earn a chance to win a stay in one of the nation's premier ski destinations for just $1 a day. The treasure hunt, which features a different destination every week for 11 weeks, begins Jan. 19 and ends March 30. A new contest starts at noon EST every Tuesday. "Our goal is to create awareness and excitement about the vacation rental industry and to show consumers how easy it is to navigate through our Web site and book a vacation online," said Cheryl Spezia, vice president of marketing for ResortQuest. "We offer so much value and so many options, people can choose exactly what they want in a vacation at a fantastic destination." Each week ResortQuest will select a vacation rental property -- a condo, vacation home or hotel suite -- at one of its ski destinations in Aspen, Breckenridge/Keystone or Steamboat, Colo.; Park City, Utah, or Sun Valley, Idaho, to be the treasure. To learn more about contest rules and how to participate in ResortQuest's Vacation Treasure Hunt, visit http://www.VacationTreasureHunt.com.